UK Car Discount has excellent deals on brand new Ford cars across the full model range, with the buyer as the first registered keeper. All vehicles are UK supplied with full manufacturer warranty and free delivery in mainland UK. The top of the range Ford Focus Titanium X features dual zone climate control, Sony DAB radio/CD with sat nav and rear view camera, Ford SYNC including Emergency Assistance, Bluetooth, voice recognition/control & USB connection, 17" alloy wheels, LED Day time running lights, bi-Xenon headlights, leather trimmed seat bolsters, heated front seats, active park assist (including front and rear parking sensors), power folding door mirrors and power operated driver seat. 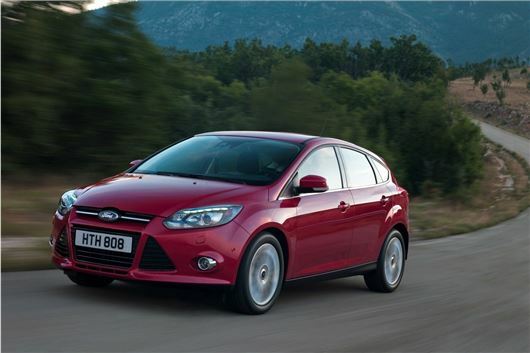 UK Car Discount has further deals with savings of up to £5000 on more Ford Focus models including Edge and Zetec models. Top of the range Titanium X models feature 16" alloy wheels, heated sports-style front seats, part leather seats, , keyless entry, electric front and rear windows (on 5 door models), leather trim steering wheel, rear centre head restraint and stainless steel scuff plates. UK Car Discount has further deals across the Fiesta range with savings of up to £3500 on Fiesta Style, Studio and Zetec models. Top of the range Titanium X models feature start/stop technology, 17" (5x2) Alloy wheels, leather trim, touchscreen navigation system with DAB radio/CD player & USB input, privacy glass, halogen headlights, dual zone air con, Quickclear heated windscreen, Convers+ human machine interface, power folding door mirrors, LED Day running lights and rear lighting, front and rear fog lights, automatic headlights and windscreen wipers, front and rear parking assist and rear centre armrest.